Homologous recombination (HR) guides the exchange of genomic material during the meiosis contributing to human inter individual variation. HR takes place between two allelic homologous regions (e.g. between two regions located at the same locus on two homologous chromosome, e.g. between a certain tract of the short arm of chromosome 3 and exactly the same tract on the short arm of the other chromosome 3). In NAHR (Non Allelic Homologous Recombination) the exchange is always between homologous regions, but located at different loci on the same or different chromosome (e.g. between a certain tract of chromosome 3 and a similar tract of chromosome 5). NAHR is basically due to the influence of LCRs/SDs on HR. LCRs/SDs may be inter- or intra-chromosomal. LCRs/SDs are not uniformly scattered across the genome and are intercalated by other LCRs/SDs with which they do not share sequence homology. The type of chromosomal imbalance or rearrangement caused by NAHR depends on several factors, like for instance the orientation of LCRs. The interaction between LCRs with parallel orientation may cause deletions or duplications, whereas the pairing of LCRs with opposite orientation may generate inversions (of note, inversions do not cause loss or gain of chromosomal material and therefore are not classified as CNVs). Whenever the pairing between parallel LCRs takes place between two chromosomes or two chromatids, besides a deletion there will always be a duplication. Clinical examples of such mechanism are Charcot-Marie Tooth type 1A, Potocki-Lupski syndrome and cases of DiGeorge/velocardiofacial syndrome. If NAHR happens between non homologous chromosomes and is followed by a crossing-over event there may be recurrent translocations. An inter-chromatid recombination may produce just deletions and not duplications. If the antiparallel LCRs pairing happens between sister chromatids, an isochromosome will be generated. 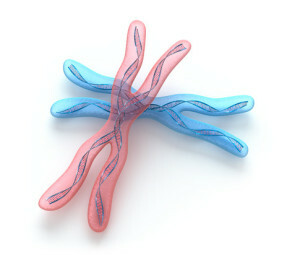 Isochromosomes may be present in tummy cells (e.g. i(17q), i(Xq), idic(Y)). Continue reading about the mechanisms of CNVs formation by jumping to CNVs: non-homologous recombination. Posted in Academia, Last Update, Medical Genetics and tagged CNV, CNVs, NAHR, Non Allelic Homologous Recombination.